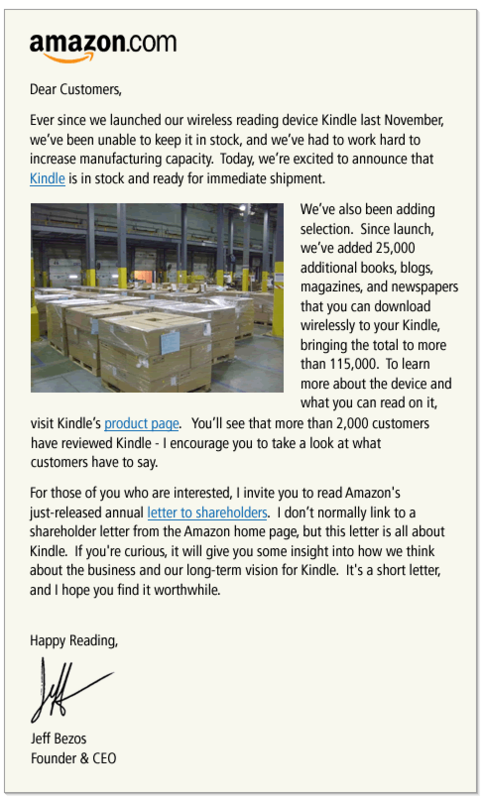 In my ECHO Marketing Seminars earlier this year, I was asked several times if the Kindle launch at Amazon.com was an example of how hyper-growth can be worse than not growing at all. While it is a good example of how we can sometimes be a victim of our own marketing success, and I still passionately advocate deliberate, healthy growth over explosive, hyper-growth, I think the marketplace is better off if we fail while daring greatly rather than timidly waiting for everything to be perfect before we launch. If we handle the inevitable hiccups promptly and with a genuine customer focus, it may even be possible for our brands to emerge even stronger. I’m tempted to suggest that Amazon’s handling of this situation will become a part of such branding folklore that gets told around the campfire, but I really think that their handling of the situation is so good, future sales of the product will eclipse any breakdowns in delivery that may have afflicted the original launch, and the stock outs will be pretty much forgotten. I commend the ownership of this situation Amazon founder and president Jeff Bezos has taken, and the lesson is a good one for all of us. They stumbled, they admitted it, and they marched on! Comments Off on But What If We Make A Mistake?